19 Members - four more than at our Royal Garden Party the previous day (BLN 1314.2188) - met around 08.30 at Paradise Wildlife Park, in a rural area about four miles west of Broxbourne. For an extra fare an on demand minibus runs from/ to Broxbourne station, although it is only 2½ miles walk from Bayford station on the Hertford loop. 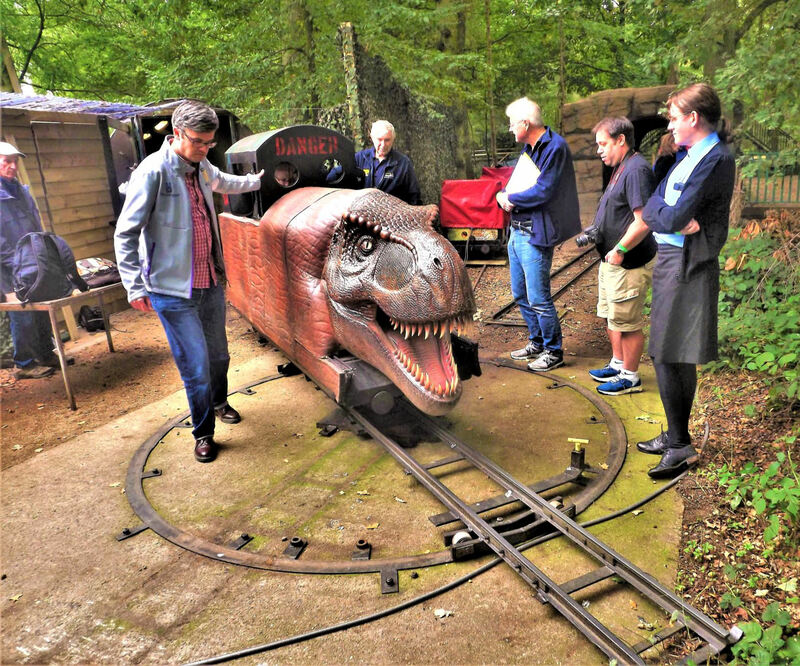 'Rex Express' Paradise Wildlife Park; traversing the shed road on and off the turntable; it unusually forms part of the running line (when rotated clockwise by 45o). Our organiser ushered us in to the Visitor Centre where we were welcomed with complimentary tea or coffee and biscuits. The big question was would there be any escapees this year (animals and/or BLS members, after the 'Animal Tracker I' Whipsnade white rhino experience of 7 Oct 2017…?). Following a briefing by the railway operator, the group was escorted inside. 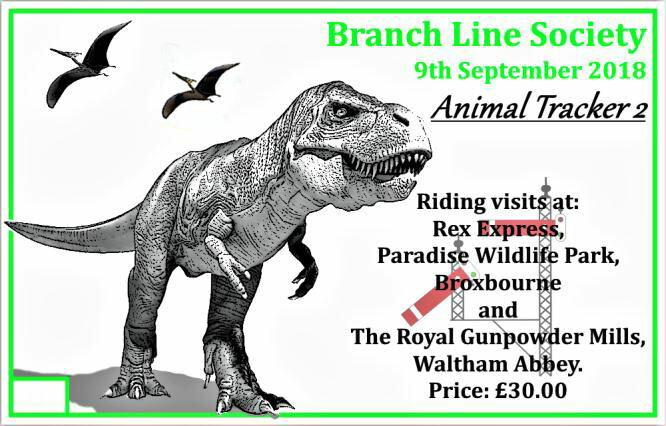 Public running starts at 10.00 which allowed an hour of exclusive use of the 10¼" gauge Rex Express (as in Tyrannosaurus Rex - it could be interesting if one of those escaped!). Motive Power was one of two steam outline engines with interchangeable bodies. The 'bodies' were in the form of T Rexes with particularly realistic heads! The 300yd public run makes a simple circuit through the dinosaur park which has many animatronic dinosaurs on display with howling and screeching as we passed (and that was just the participants…)! It runs over the turntable before returning to the platform. Obviously two circuits were requested! Then, under the watchful eye of a pair of (real) wolves in their adjacent pen, a series of moves was made that even Marc Bolan would be proud of! Using the other (older, circa 1971) loco, participants were 'people powered' in and out of the single road shed, a significant branch, from the turntable. Another stub was available off said turntable which was duly marked off, riding on a single carriage. The natives were becoming restless as the line was required by the public, but we were happy with again 99% coverage! Our fare also allowed access to the park afterwards, which several members took advantage of in the break before the next visit. Our peripatetic duo made for Hertford East exploring the remains (there were few) of the start of the line that once went through to Welwyn Garden City. Bangs Galore and Gunpowder Creek Railway, the electric 'tram' at Wilson's Folly station, the long headshunt curves round to the right out of view. Then it was onward to what some considered the highlight of the whole weekend. The Royal Gunpowder Mills, Waltham Abbey, Essex now with two operating railways (BLN 1312 MR170). We began soon after 13.00 at the 7¼" gauge 320yd Bangs Galore and Gunpowder Creek Railway which was formerly known as Uncle John's Railway. A powerful heavy 4-wheel Battery Electric Loco was provided with Uncle John himself driving. Starting from Wilson's Folly station the run round loop and, after a bit of persuasion, the long headshunt to the buffers were covered before the normal running line. Bypassing the shed the stock was on display. 100% coverage was achieved at the terminus 'Main Lab'. Back at Wilson's Folly, sadly, the train split the points entering the platform! Rerailing was achieved with the aid of a 'rolling bar' and jack, itself interesting to watch, but took quite a while. This rather put paid to proceedings here so the half of the party who had just ridden walked to the new 2' 6" narrow gauge line near to Main Lab station. Regular public running (a return trip of nearly a mile) only began on 15 Jul but not on that many days so far and 250 passengers had been carried by the time of our visit. Some school holidays and special events are the best bet. 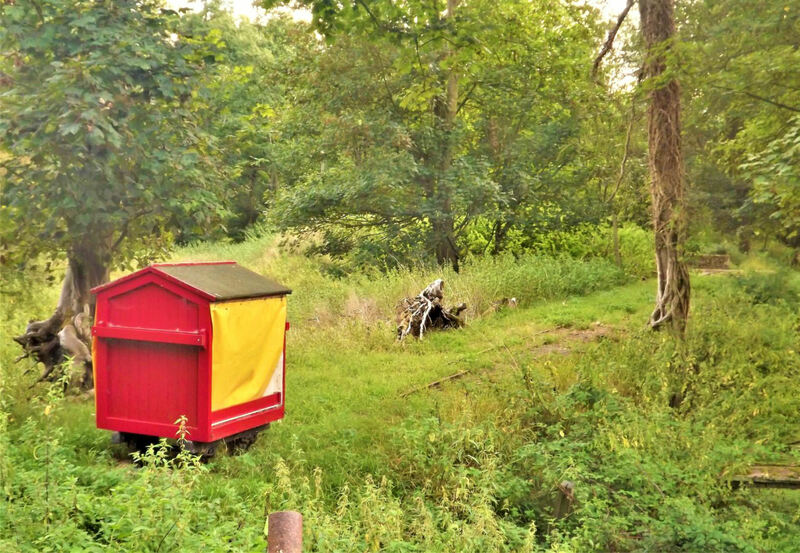 Loco DH888 was provided at nearby South station to do the run round loops (well south of the station and way beyond the normal public run) then also at North station, following a pleasant and interesting 800yd ride in woodland alongside the River Lea. They even positioned the coaches (instead of the loco) at each end of lines when we touched the buffers - a well 'trained' railway… or rather briefed by our organiser. A few then rushed off to catch a railtour at Amersham (BLN 1313.1964)! However, most stayed for a fascinating and very informative 'Land Train' tractor/trailer conducted tour with an interesting live commentary. This covered much of the vast 175 acre site with 21 buildings of major historic interest (and much more besides). A target was the remains of the former 18" gauge internal railway - the main remnant was a 150yd stretch. 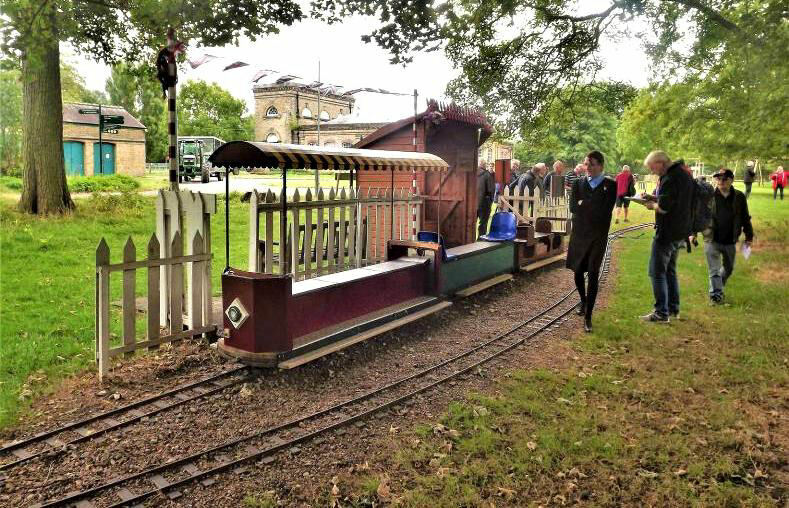 A replica demonstration wagon body had been built on an original bogie for display, in appearance a bit like a henhouse% on wheels. On close inspection it was found to move and would accommodate two consenting adults (‽); the track, while rough, was traversable! So the inevitable happened and some plucky (%or 'clucky') members enjoyed the rarest track of the weekend! This was to the surprise of the tour guide and tractor driver but not the other participants. It is worth spending a whole day at this fascinating site - very suitable/educational for families, but it is difficult to find days when both railways run (Wed 24 Oct was one in half term - watch the website). 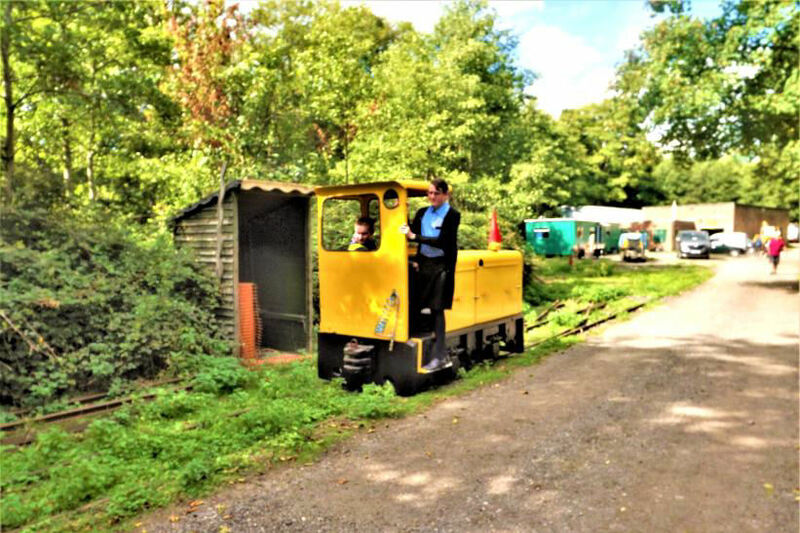 Totally irresistible … 18" vehicle and track at the Royal Gunpowder Mills. Complimentary Tea/Coffee and biscuits were then provided in the café with time for a chat before finishing at around 16.20. Many thanks to all five locations for hosting us and particularly to Bill Davies for his excellent, meticulous organisation and local knowledge... no animals escaped either. Then (or at another point in the weekend) some members made for Bethnal Green on the Central Line as trains were turning back from the west in P1, then taking the rare trailing connection to the Westbound line on departure. This can be seen from the end of P1; it is much longer and more significant than just a crossover. At Loughton, the other end of this weekend engineering closure, trains from Epping turned back in the two faced centre platform (P2/3), also of interest to some of our group.